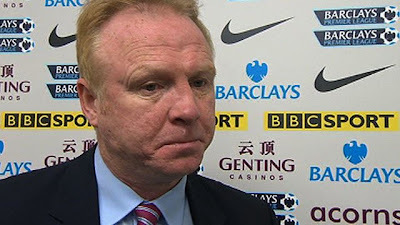 Having not been the most popular choice in the first place, Alex McLeish finds himself under growing pressure, if not from the club itself, from the fans. His style of football is hardly crowd-pleasing and, despite sitting in the top half of the Premiership table, the position is deceptive, given the fixtures played thus far. So, what can McLeish do to change things and try and rectify some of the recurring problems that have been costing Villa this season? From all outside impressions, finances are likely to be tight come January, so wholesale replacements are unlikely. Any changes are likely to have to be made with the existing personnel, or at least, with revenue generated from selling players. We will test some of the theories about Aston Villa this season by looking at the statistics to see whether they are provable, then move on to try and find some solutions to rectify the problems. One of the major gripes with Alex McLeish’s team this season is a seeming reliance on hitting the long ball. 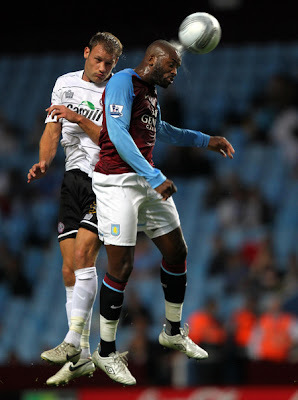 With Darren Bent (at under six foot) often playing as a lone striker, he struggles to win much in the air against centre-backs, resulting in Bent unable to get into the game and Villa unable to build attacks. So, if this is true, what statistics would we expect to find to prove this? Conveniently, there are statistics out there on the number of long balls played by each team. In their sixteen matches this season, Aston Villa have played 871 long balls, or just over 54 per match. At first glances it seems high, although some comparison is needed. Stoke are a team renowned for the long ball game. The statistics show that they have indeed played more long balls than Villa, racking up 969 in their sixteen matches so far. However, the statistics go on to show that there are actually eight teams in total that have played more long balls than Villa this season. Indeed, there are four other teams (Wolves, QPR, Sunderland and Norwich) that have played more long balls than Stoke this season. It would therefore seem that Villa do not play an abnormal number of long balls. However, do other teams employ the long ball more successfully? We have statistics on number of accurate long balls, so we can work out a percentage of long balls that accurately find their target. Villa are one of only five teams whose percentage drops below the 50% and only Blackburn have a lower percentage of accurate long balls than Aston Villa’s 43.2%. We might also suspect that a long ball to Darren Bent is likely to be less successful than a long ball to the likes of Stoke’s Peter Crouch or Norwich’s Steve Morrison. This minor point is backed up by the fact that Darren Bent has touched the ball on average fewer times than any other player in the Premier League this season. His 24.6 touches per game puts him comfortably below his nearest challengers of Danny Graham (28.7), Ryan Shawcross (35.2) and Demba Ba (35.4). So while Aston Villa may not play any more long balls than other mid- and lower-table sides, when they do play them, they are less accurate and to an unsuitable target. Linked to the long ball argument, there has also been an accusation that Villa struggle to build attacks through passing and tend to give away possession cheaply on a regular basis. The obvious statistic to look at here is the number of passes attempted in open play along with the number of passes completed in open play. In their sixteen matches this season, Aston Villa have attempted 6,196 passes, completing 4,317 of them. This converts to a pass accuracy of 69.7%. Again, we need to compare these figures to the other teams in the division to get a true representation. In terms of the raw number of attempted passes, only Blackburn (5,972) and Stoke (5,394) have a lower number than Aston Villa. The newly promoted teams all have a higher figure, with Swansea’s astonishing 9,310 sitting behind only Arsenal, and being over 50% higher than Villa’s tally. However, it is only worth attempting a lot of passes if you are going to successfully complete a high number of them. Maybe Aston Villa do not attempt many, but have a high success rate? Alas, the figures once again make depressing reading. Aston Villa’s pass accuracy of 69.7% places them in 18th place in the Premier League table, ahead of the usual suspects, Stoke and Blackburn. Indeed, Swansea have the highest pass completion rate in the Premier League, linking in nicely with their high number of attempted passes. Last season, Gerard Houllier attempted to change the system to a more fluid, passing game. How does last season compare with this one? This season, Alex McLeish’s Villa have attempted an average of 387.3 passes per match. In comparison, Gerard Houllier’s Villa attempted an average of 444.5 passes per match with a slightly higher success rate of 70.9%. So, Aston Villa attempt relatively few passes relative to the rest of the division and complete even fewer of them. Not a set of statistics that helps the case for McLeish. The £24m signing of Darren Bent was meant to be the coup that would see Villa finding the net on a regular basis. After all, Bent has scored double figures in the league in all but one of the past nine seasons. However, he has struggled to find his form this season, which could partly be explained by a lack of opportunities to touch the ball, let alone score goals. So, do Villa struggle to create chances relative to the sides around them in the league? The statistics would tend to agree. Only Stoke have had fewer shots on goal than Aston Villa’s 134 this season. This works out at just over 8 shots per game. As if that wasn’t depressing enough, Villa also finish 19th out of the twenty Premier League sides in terms of shot accuracy. Villa’s 36.6% shooting accuracy is only beaten into last place by QPR’s 33.8%, although QPR higher total shots means that they have still had more shots on target this season. Combine those statistics and we discover that Villa have had a grand total of 49 shots on target in the Premier League this season, or fractionally over 3 shots on target per match. Interestingly, there are six teams that have scored fewer goals and another three that have scored the same number of goals as Villa. Villa’s 18 goals from only 49 shots on target mean that they have been scoring 36.7% of the time that they have a shot on target. 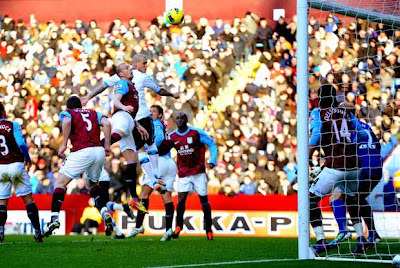 However, the problem remains that Villa simply do not create enough chances. Regardless of whether they take their chances when they do come, 3 shots on target per match is simply not enough to ensure that you score the goals to win matches. This is the simplest theory to prove out of them all. Last season, Villa conceded 14 goals from corners, which was a joint league highest, and meant that almost 25% of the goals conceded came from corners. In the early weeks of the season, things seemed to have improved on this front. During the first seven games of the season, Villa did not concede a single goal from a corner. However, worryingly, the problem seems to have resurfaced with a vengeance in recent weeks. In the past nine matches, Villa have conceded nine goals from corners. In other words, Villa have been conceding one goal from a corner every match. Alex McLeish is renowned from his Birmingham days of creating a solid defensive unit, and to be fair, from open play, Villa have not conceded too many goals. Although the defense may look disjointed and last-ditch at times, Villa have conceded only 10 goals from open play in 16 Premier League matches this season. Combining these facts, it shows that just over 43% of the goals that Villa have conceded this season have come directly from, or as a result of, a corner. In theory, this would suggest that if McLeish could sort out the problems from corners, he would have the cornerstone of a solid defensive line from which he could progress to look at other areas of the side. Having looked at the statistics, they would appear to more or less tally with the general view of Villa fans so far this season. While Villa have not played any more long balls than the majority of similar teams, the actual success rate is far lower, suggesting that the players playing the long ball and the target are not quite right. The passing has been lacking in both quantity and quality, which leads on to the next problem of creating a lack of chances. Finally, corners are still a worrying weak point for what is otherwise becoming a relatively solid Villa defense in open play. In the second part of this article, I will look at how McLeish could tweak his tactics to try and solve some of these problems, and at some realistic targets for the upcoming January transfer window that could fit into this new system.